Alien303 v2, Virtual subtractive synth from G-Sonique. 7 years after releasing their original Alien 303 virtual synthesizer, G-Sonique have released an updated version of it. According to G-Sonique, this new version offers much more features, fatter more precious sound and more sound creation possibilities. well as trance, house, techno and all EDM styles. You can choose between two modes, classic stable and analog with slight detuning and analog style of sound. Also, while Alien 303 V1 offered a single filter, V2 features 9 of them, and you can select from 14 oscillator waveforms, rotate oscillator phases , choose semitones and more. 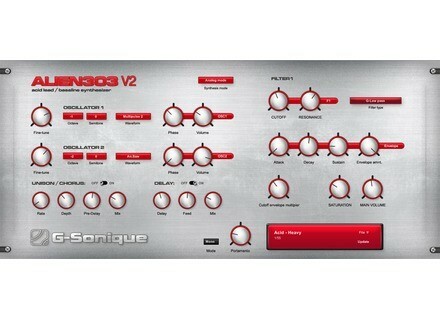 While the Alien 303 V2's standard price is set at €29, the first 100 customers can benefit from a special introductory price of €16.90 at G-Sonique's webshop. MeldaProduction presents MCharacter MeldaProduction has released version 9.14 of all its plugin roster which now includes MCharacter, a new harmonics controller and generator. One-day sale on SPL TwinTube at Plugin Alliance Today's offer from the Plugin Alliance's X-Mas Calendar concerns their SPL TwinTube processor, available for $69. D16 Group to release Decimort 2 D16 Group is about to release Decimort 2, an updated version of their bit crusher and sample rate reducer.